Hadassah medical personnel are often in the United States for meetings or conferences, to study or present research papers. There have been national Hadassah conventions at which we hosted more than a dozen professionals from our hospitals. But I want to focus on one pivotal mission, involving what was most likely the largest group of Hadassah medical staff ever to gather in Manhattan at a single time. There were 44 of them—nurses, obstetricians, gynecologists, pediatricians, dentists, public health specialists, administrators, a pathologist and an ophthalmologist, among others. Although they had professional discussions with one another, they made no speeches or presentations while in town. They were just passing through. Hours before their scheduled departure, members of the group gathered to decide what to do with their last night in Manhattan. Some decided to take in a Broadway show, others to find the best restaurant they could afford. A few intrepid souls went to a fortuneteller. When, you might wonder, did this gathering take place? That last night out was on June 11, 1918, and these 44 individuals were members of the American Zionist Medical Unit, the seed of the Hadassah Medical Organization, just before embarking for Palestine. June 11 isn’t one of the dates etched on our organizational calendar, but it has everything to do with the Hadassah milestones we celebrate this year. Remembering the mobile hospital and staff we shipped across the ocean—with enough medicine and equipment for a 50-bed facility, including two ambulances—gives us a palpable sense of the real people who built the foundations on which Hadassah’s hospitals stand. How precious it is to recall our medical pioneers in the centennial year of the Henrietta Szold Hadassah-Hebrew University School of Nursing, of HMO’s Department of Ophthalmology and of HMO itself, not to mention the 70th anniversary of Israel’s independence? Looking back offers us a glimpse of Hadassah’s infancy—and the swirling cauldron of events that formed this organization. World War I was raging as our founding medical unit sailed on a troop ship; they would pass through three submarine zones during their voyage. When they reached their destination, the British were still battling the Turks within 40 miles of Tel Aviv and Jerusalem. I thought of all the founders—Israel’s and Hadassah’s—when I celebrated Yom Ha’atzmaut in Jerusalem in April, and again when I attended a scientific conference in June hosted by the 100-year old ophthalmology department and featuring guest lecturers from around the world. 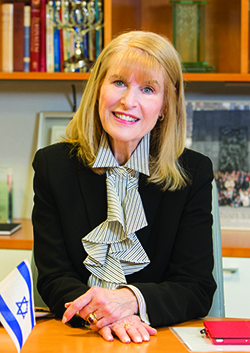 I’ll be in Israel again in October for From Dream to Innovation: Hadassah’s Milestone Mission, during which we’ll walk in the footsteps of our early nurses, doctors and leaders and visit the world-class medical institutions that flourish because of their efforts and the dedication of generations of Hadassah volunteers. There’s still time to sign up for the mission. We belong to a privileged generation. Though we live in troubled times, America is free and affluent and Israel is sovereign and strong. But to those whom much is given, much is expected. The very rights and comforts we enjoy also make demands of us. They tell us that education, careers and loving families are not enough. We must be part of something larger than ourselves. There is no shortage of movements that promote human welfare. What we have in common with the people in every nation and of every faith who work to reflect their values is that we choose the cause and the means. Those of us who choose Hadassah do so because it sustains us as we work to heal and nurture others. It links us to one another, to the Hadassah women who went before us, to Israel and to the highest ideals of our people. It gives us a season to celebrate and a lifetime to repair the world. And it connects us to a last night that preceded a new dawn.